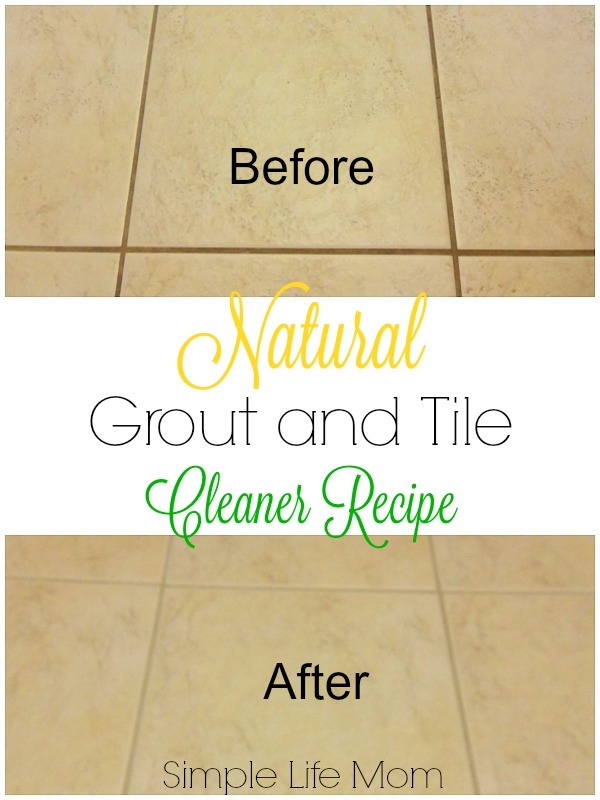 This Natural Grout and Tile Cleaner recipe is the floor cleaning recipe of my dreams…well, if I did dream about cleaning floors they would clean themselves. But this recipe is great! Super excited to tell you about it! I am not saying this did not take time and elbow grease. It took me 30 minutes to get the paste onto all the grout in my kitchen. Then I scrubbed with a wet scouring pad, taking time to spread it over the tiles and scrub them as well. This is not something I will do monthly, but it is something I will do once a year. 1. Mix ingredients into a paste. 2. 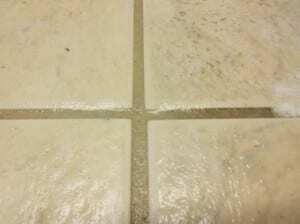 Rub paste onto grout. It was easier to get a clump in my hand and rub it on in one direction. 3. Wait at least 30 minutes and then scrub. You may be able to see how the right was darker because I hadn’t scrubbed it yet. This is something that never happened with normal scrubbing, so even though it took elbow grease, it really did an amazing job that couldn’t have happened without it. ***Next time I believe I will spray the grout with hydrogen peroxide, let it set, then come back and sprinkle with baking soda and then scrub. This will cut out the time of rubbing the grout cleaner on the grout. If you try this method instead, let me know how it turns out. Method One: Mix equal parts soda, vinegar, and salt. Spread onto grout. Let it set, then scrub. Method two: Spray floor with vinegar. Sprinkle with salt and baking soda. Let set. Scrub. *linked to Some of these great blogs. Just tried your grout formula. It’s a miracle! Expected it would make a difference, didn’t expect it would make such a fantastic difference…like our ceramic kitchen floor is reborn. Big THANK YOU for sharing this. Just came across your blog. I love diy cleaning recipes! Do you think this would work well on shower tiles? I tried straight hydrogen peroxide, and it made a slight difference, but I’m wondering if you think this mixture would work better for getting rid of mold/mildew. I actually sprayed my shower tiles with hydrogen peroxide, then threw baking soda all over them and let it set that way. It was the end of a very tiring day though and I did not take the time to really scrub afterward. It worked, but not as good as in my kitchen. This could be due to the fact that some mildew was already growing, whereas in my kitchen it was just loosening dirt and brightening the surface. So, it still worked, but not as shocking as the kitchen. Do you mean 3 cups of Baking Soda? LOL! Yes, that’s quite a typo. Thanks for catching that! That is pretty awesome. Its ingredients are affordable and really easy to find. 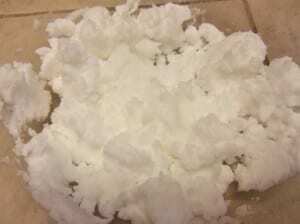 I bet, a lot of people use this homemade tile grout cleaner, most especially those who have trouble cleaning their dirty tiles. Worth the share. Kelly! I SHALL try this on the grout in our Men’s bathroom at church. I’ll be sure to let you know how the Hydrogen peroxide first works to clean up the grout. It sure needs it. Thanks Marjie. I hope all goes well. Get one of those guys in there scrubbing!! For years, I lived in a home with white tiles and white grout in the kitchen. It was a nightmare to clean. I wish that I had this cleaner recipe back then! Yes, I’m ready to pretend it’s dark grout ? but doing a deep clean once or twice a year is not too bad. Love this! I wish I’d known about this years ago. Thanks so much! I love this idea!! I need to do this so bad. The grout in our front bathroom is just yucky looking. What great results, I need to try this! Our bathroom grout is a mess but I never knew what the best way to clean it was. I am definitely going to try this out. Thank you!! What a great idea! I have white grouts that have become grey. I will definitely try it! I will definitely be giving this a try. 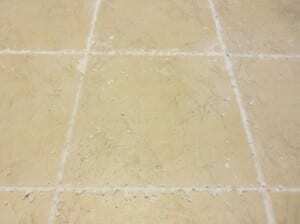 My kitchen floor – oy the grout is terrible. I lvoe you natural way to tackle it. I’m definitely going to give this a try! Your results are super! My bathroom tile needs to be spruced up! What a simple recipe! I have grout that needs to be cleaned so I will give this a try. Thanks!